Sign Up for Prayer Campaign! Throughout the year, pray with Priests for Life for the protection of the unborn! 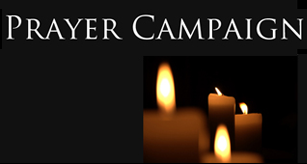 Our various prayer campaigns correspond to the different seasons and special days of the year. By signing up below, you are letting us know that you will participate, inasmuch as it is possible, in saying the various pro-life prayers that we have here for different times of the year. And you are enabling us to encourage all our fellow believers by letting them know how many hundreds of thousands of people are also participating! Thank you so much!